If you believe bigger is better, you should check out big rabbit breeds. Some giant rabbits make excellent pets because of their docile natures, while others require careful handling. The American Rabbit Breeders Association (ARBA) recognizes a variety of large breeds, and each has its own charm. Called the "king of rabbits" because of its massive size, the Flemish Giant is the biggest rabbit breed of all. The breed is thought to have originated from stone rabbits in the old Flemish region. According to the National Federation of Flemish Giant Rabbit Breeders (NFFGRB), Flemish Giants typically reach an adult size of 14 pounds. However, this breed has been known to hit weights as high as 22 pounds. Does tend to weigh more than bucks. One of the largest Flemish Giant rabbits recorded is Herman. Herman is owned by German breeder Hans Wagner. He weighs in at a whopping 22 pounds. Rudi is another record holder. His weight is a kilogram more than Herman, but he is not quite as well known as the slimmer rabbit. Flemish rabbits are a hardy breed. The main health issues to be aware of are sore hocks from standing on wire-bottomed cages and issues with gaining too much weight. This breed is gentle and docile if socialized at a young age. 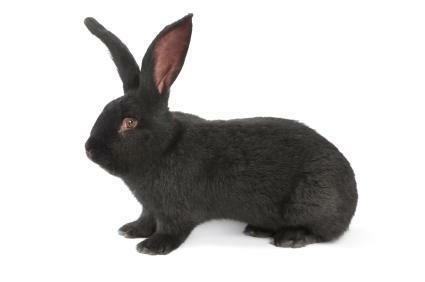 According to the American Checkered Giant Rabbit Club, this large breed should be long in both length and leg. The average Checkered Giant will weight at least 11 pounds for bucks and at least 12 pounds for does. The origin of this breed is unknown. However, some people believe the breed originated from a cross between a Flemish Giant and a Lop or possibly a white breed with markings. The color pattern of the Checkered Giant is unique with a white coat and black or blue markings. The rabbit has circles around the eyes, a butterfly on the nose, a strip of dark fur down the spine, and markings on the face and body. 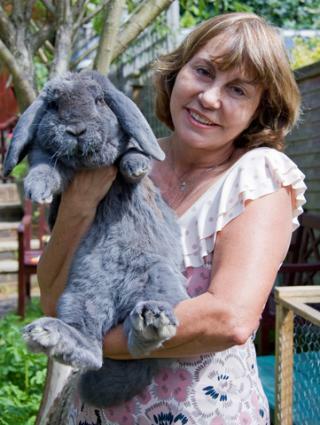 Although Checkereds are large rabbits, they don't quite measure up to the Flemish Giant or the French Lop and have not broken any known records. The breed is known to bite and has a nervous temperament, although each individual rabbit will have a different personality. It is best to use an experienced handler if you plan to show this breed. Giant Checkered rabbits are also called Giant Papillons in the United Kingdom. According to the National Angora Rabbit Breeders Club (NARBC), this breed must reach at least nine and a half pounds for senior bucks and 10 pounds for senior does. This gorgeous, show-stopping animal has long white fur and pink eyes. The wool can be removed with sheers or by combing. The breed originated in Turkey in the area called Anakara, or sometimes called Angora, and they were kept by French Royalty in the 1700s so that they could weave angora wool from the fur. These rabbits are generally calm and easy-going. They look like puffs of white fur with a face peering out, and they have large, floppy ears. The coat has three different types of fur. The Giant and German are the only Angora breeds to have awn hair. Out of the recognized Angora breeds, the Giant is the largest. Due to their long fur and personal grooming habits, Angoras are prone to wool block. The Giant Chinchilla Rabbit Association has a nice collection of images of Giant Chinchilla rabbits. This rabbit was developed in the United States by Edward H. Stahl and dates back to 1921. Million Dollar Princess was the first Giant Chinchilla doe born. She was a cross between a Standard Chinchilla and a Flemish. A grown buck weighs 12 to 15 pounds, and a grown doe weighs 13 to 16 pounds. These rabbits are known for their commercial qualities and are often used as meat. This factor is considered in judging. Giant Chinchillas are gentle and have a sweet nature. They have a large litter of six to eight babies easily. Giant Chinchillas have no major health issues, but they can be sensitive to extreme heat like any rabbit and prone to weight gain. The French Lop's history is clear in its name. According to the Lop Rabbit Club of America, the breed hails from France, where it was created in the 1800s by crossing an English Lop and a butterfly rabbit. This breed comes in a variety of colors with a dense, soft fur. The French Lop weighs about 10 pounds. This rabbit has a short, heavy frame and shorter ears that hang down on either side of its head. They are an intelligent breed and tend to be good tempered and tolerant of children. They like company, so try to keep them in pairs. French Lops do not have major health issues, but they do have the problems any other rabbit might have such as overgrown teeth, flystrike or fleas. Now that you know a little more about some of the giant rabbit breeds, you should have a better idea if one of these rabbits really interests you enough to take on caring for one. Although the majority of ARBA-recognized breeds are listed, you could also consider other varieties of giant rabbits like the German Giant, British Giant, or the Spanish Giant.